The administration retreat runs counter to the letter and the spirit of Obama’s presidential campaign. The man who ran on the “Audacity of Hope” has now taken a more conservative stand than Senate Majority Leader Harry Reid (D-Nev.), leaving progressives with a mix of confusion and outrage. Democratic leaders on Capitol Hill have battled conservatives in their own party in an effort to get the 60 votes needed to overcome a filibuster. Now tantalizingly close, they are calling for Obama to step up. “The leadership understands that pushing for a public option is a somewhat risky strategy, but we may be within striking distance. A signal from the president could be enough to put us over the top,” said one Senate Democratic leadership aide. Such pleading is exceedingly rare on Capitol Hill and comes only after Senate leaders exhausted every effort to encourage Obama to engage. But with fundamental reform of the health care system in plain sight for the first time in half a century, the president appears to be siding with those who see the Senate and its entrenched culture as too resistant to change. Administration officials say that Obama’s preference for the trigger, which is backed by Maine Republican Sen. Olympia Snowe, is founded in a fear that Reid’s public option couldn’t get the 60 votes needed to overcome a GOP filibuster. More specifically, aides fear that a handful of conservative Democrats will not support a bill unless it has at least one Republican member’s support. The president’s retreat leaves Reid as the champion of progressive reform — an irony that is not lost on those who have long derided the Majority Leader as too cautious. “Who knew that when it came down to crunch time, Harry Reid would be the one who stepped up to the plate and Barack Obama would shy away from the fight,” emailed one progressive strategist. “He certainly didn’t embrace it and he seemed to indicate a preference for continuing to work on a strategy that involved Senator Snowe and a trigger,” said one aide briefed on the meeting. Several other sources, along with independent media reports, confirmed the exchange. On Saturday, the activist group Progressive Change Campaign Committee — which just days earlier had targeted Reid in a separate campaign — took out a new television advertisement in Maine accompanied by an “emergency petition.” Titled, “Time to Fight,” the spot featured a former Obama campaign volunteer pleading with the president not to abandon the public plan. MoveOn.org rallied its base on Friday. “The President has said many, many times that a public option is the best way to keep insurance companies honest and lower skyrocketing health care costs. Senate Democrats are ready to fight for a public option — if the White House gives up now, it would be a tragic mistake,” said an e-mail to the group’s membership. 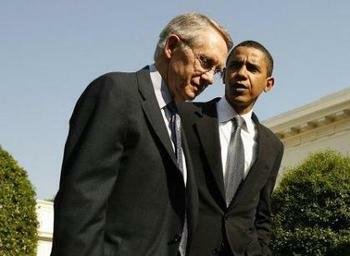 White House aides responded to the pressure not by embracing Reid’s more aggressive stance, but by denying reports that he was discouraging the opt-out proposal. But the push-back, say sources with direct knowledge of deliberations between leadership and the administration, does not square with Obama’s private indications to Senate leaders. The sources say that the president has left little doubt about his apprehension regarding an opt-out approach. It is not philosophical, one White House aide explained, but is a matter of political practicality. If the votes were there to pass a robust public option through the Senate, the president would be leading the charge, the aide said. But after six months of concern that it would be filibustered, the bet among Obama’s aides is that Reid is now simply being too optimistic in his whip count. The trigger proposal, said Democratic aides, has long been associated with White House Chief of Staff Rahm Emanuel. “He’s been so convinced by his political people from the beginning that we can’t get a bill with a public option, he’s internalized it. Even though it’s now become obvious we can get a bill without selling out the public option, he’s still on that path,” said a top Democratic source. The White House, he said, continues to assure progressives it’ll improve the bill in conference negotiations between the Senate and House, but advocates are unconvinced. “If we’re this close in the Senate and they’re not helping us, I have a feeling they could screw us in the conference,” said one. Advocates of a public option largely consider a “trigger” the equivalent of no public option at all. A trigger would implement a public option only if insurance companies failed to meet certain benchmarks over time and it would only be implemented in the regions of the country where those benchmarks weren’t met. The Medicare prescription drug proposal passed in 2003 includes a “trigger,” but the public provision has never been activated despite soaring drug costs. The industry can help craft the trigger language and can game its stats to prevent it from becoming reality.